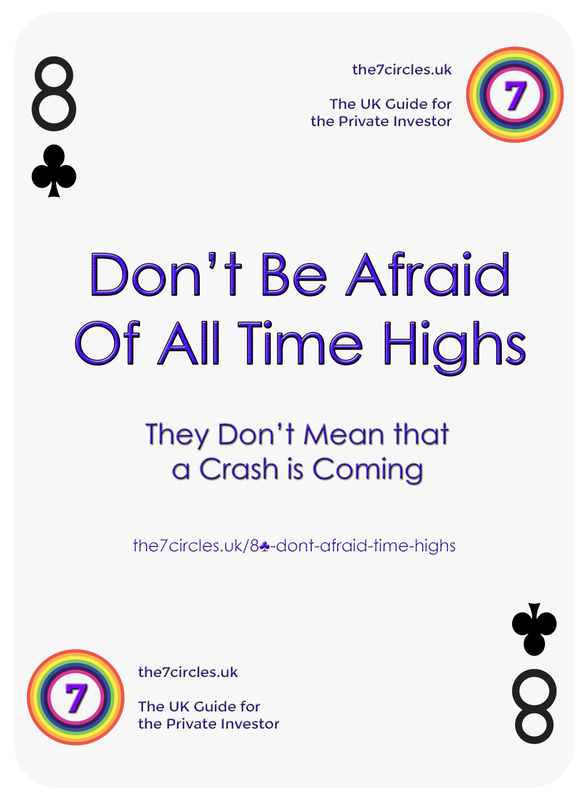 Don't be afraid of all-time highs - they don't mean that a crash is coming. At the time of writing (January 2017) the FTSE-100 index here in the UK is just below an all-time high (ATH) it hit earlier this week. The previous peak was in April 2015, almost two years ago. The one before that was on the last trading day of 1999, now more than 16 years ago. When the FTSE is near its peak, people get nervous. They feel the same way when an individual stock is near it’s ATH. Surely now can’t be a good time to buy? Today, I’m going to try to persuade you that you don’t need to be afraid of all time highs – they don’t mean that a crash is around the corner. I’m indebted to Ben Carlson over at A Wealth of Common Sense. He’s written several times on this topic, and done some research on the US market that I will be referring to. The first thing to say is that all-time highs can be dangerous. We had bad crashes after the ATH in 1999, and the near ATH in 2007. Going even further back, we had another bad crash after an ATH in 1987. That’s what people remember, but it’s not the whole story. The problem is that there are lots of days that are all-time highs, and most of them don’t lead to a crash. Ben’s analysis of the US market going back to the 1950s found that most decades there were hundreds of days where an all-time high was recorded. The 1990s came top, with 306 days, or 12% of trading days. Second best were the 1950s, with 288, or 11% of trading days. The worst decade for ATHs was the 2000s, with only 13, or 0.5% of trading days. The 1970s were also bad, with 35, or 1.4% of trading days. I think that the poor performance of the 2000s is another reason that many in the current crop of investors are wary of ATHs. We’ve lived through a few several bad crashes preceded by ATHs, and the decade following the dot-com blowoff didn’t provide enough “safe” ATHs for us to forget. It’s a form of recency bias. The average for the entire period is that ATHs make up 7% of trading days. The general pattern is clear: we get lots of ATHs in boom decades, and very few in bear decades. But if you think about it, that means that you should be keen on ATHs. Wouldn’t you rather be invested through a boom market rather than a bear? Well, you can’t have a boom decade without sitting through hundreds of ATHs that don’t lead to a crash. The average secular (long-term) bull market has 127 ATHs before it finally turns into a bear. The average return one year later was 10%. Three years later the market was 31% higher on average. Five years later the market was 54% higher. One year out, returns were positive in 74% of cases. After three years, you had an 87% chance of being ahead. After five years, chances declined slightly to 83%. The returns are similar to the average gains in the US market over these time frames. With 1,157 ATHs since 1950, and only around seven major crashes (depending on how you define them), the odds of an ATH leading directly to a crash are not good. Tyler Denholm at ETF Trends calculated that over the nine bull and bear cycles in the S&P 500 since 1937, the average time between a the market passing its old high and a true market peak (the start of a bear) was 50 months (more than four years). The shortest continuation period was only four months (which happened three times) but the two longest runs were more than ten years. The average gain over these nine continuation periods was 98%. The smallest gain was 1% but the largest was 354% (up to March 2000). Basically, the stock market trends up, and often trends up from an ATH. It’s about time in the market, not timing the market. Every crash – and every correction and regular bear market – can be traced back to an ATH, but only in hindsight, not at the time. In another article, Ben looked at the characteristics of market tops. Subsequent falls ranged from 19% (2011, 1998, 1976) to 57% (in 2007). Inflation ranged from 0.7% to 12.6%. There was no discernable pattern that indicated a peak. As the market saying goes, “No one rings a bell at the top”. So, assuming that you’re no longer afraid, how should you invest when the market is near an all time high (like now)? The first thing is to remember that the market is almost always near an ATH, and that there is always something for the market to worry about. The biggest thing, as always, is to focus on the holy trinity of costs, taxes and asset allocation. These are the things that you can control, unlike the markets. The most relevant of these is asset allocation. Make sure that your portfolio is diversified across stocks, bonds, cash, property and commodities (as well as across geographies). It’s unlikely that all these assets and markets will be at ATHs at the same time, or that they will all crash at the same time. How much should be in stocks depends on your risk tolerance. You can take our risk tolerance questionnaire here, or you can use the simple approach of “how big a loss can I stomach”? The stock market will crash by 40% at some time in the future (and will then recover). So if you can only tolerate a 20% loss on your portfolio, you can only have 50% in stocks. If you can only tolerate a 10% loss, you can only have 25% in stocks. It’s crucial that you get this right – you mustn’t sell in a crash. Once you have your asset allocation worked out, it will tell you whether you should be adding more money to the stock market. An extra precaution that you can take is to hedge your exposure. The easiest way to do this is to use spread bets on the relevant market index, with a guaranteed stop loss. That way you are protected against a crash (to whatever extent you prefer) and if stocks keep going up, you’ll only lose the first 3% or so of the new upside. Another approach is to use options by selling (out-of-the-money) puts on the index, or an index tracking ETF. If the market keeps going up, you get paid each month for offering the puts. If the market does crash by 10% or more (depending on the price of your puts) then you get to buy into the market at a lower price than when you sold the puts. The lower the price of your puts, the cheaper you get to buy in. You are also more likely to get paid for a longer time for selling the puts. But of course the monthly income will be much lower for puts that are a long way out of the money. These days, I’m not clear how the typical private investor in the UK can trade options directly. Most offers appear to be spread bets or CFDs based on underlying option prices. A fourth approach, as an alternative to lump-sum investing according to your asset allocation model, would be to “pound cost average” – drip feed the money in over several months. Generally this is a bad idea because stock markets trend up and you want your money to be invested for the longest time possible. But close to all time highs, you might take the view that there’s a decent chance you will get better prices over the next six or twelve months. A variation on pound cost averaging3 is value averaging (VA). Here you set a “value path” of how much you want your investment to be worth over the period you are investing. Here the value path would be for the portfolio to increase by £1K per month. To reach your £2K target for the next month, you would only need to invest £900. Conversely, if the market goes down 10%, your initial investment would only be worth £900, and you would need to invest £1.1K to get to £2K. Note that this can be hard to do for psychological reasons. VA means that you invest more when prices have fallen, and therefore buy more shares. Compared to DCA, you save money in a rising market, but lose money in a falling market. Since markets mostly rise, VA is generally the better approach (but not as good as lump sum). Both work compared to lump sum investing at a peak, but DCA is the best when you are afraid of a market fall. So an all time high needn’t portend a crash, and there are plenty of ways to invest around one. If I’ve reassured you on that, here’s another thing for you to think about. As Ben points out, since only 7% of days are ATHs, 93% of the time the market is in drawdown from the last high. So alongside worrying about the next crash for 7% of the time, you could also worry about not having sold at the previous high for the other 93% of the time. Regret or worry, both or neither – it’s your choice. But remember: Don’t be afraid of all-time highs – they don’t mean that a crash is coming. Some great stats in there that make you realise the all time high’s are actually quite a frequent thing! It also depends at what stage you are – building wealth or living on the wealth. At this stage I am still building – I recently bought some more VHYL even though it felt expensive to me, as its the time in the market that counts, I can keep getting the dividends, and I wont realistically be looking to utilise it for a good few years. There is no way to avoid stock crashes and the wise think to do in such scenarios is to keep calm and hold. If you have been loyal to a specific stock for some time then continue and you will be rewarded. The rare cases do not much affect your wealth accumulation. I have held RIL (BSE) shares for close to a decade now and it’s never disappointed me.